According to the Associação Nacional dos Fabricantes de Veículos Automotores, Brazil's new generation of cars and trucks adapted to run on ethanol (alcohol) has just hit the two-million mark. 'Flex-fuel' vehicles, which run on any combination of ethanol and petrol, now make up an impressive 77% of the Brazilian market. Volkswagen and Fiat vie for the first place and both car manufacturers produced and sold around 200,000 flex-fuel vehicles in the first 6 months of this year. Ethanol-driven cars have been on sale in Brazil for 25 years, but they have been enjoying a revival since flex-fuel models first appeared in March 2003. Just 48,200 flex-fuel cars were sold in Brazil in 2003, but the total had reached 1.2 million by the end of last year and had since topped two million, the Brazilian motor manufacturers' association Anfavea said. (Statistics for the type and number of cars produced and sold in Brazil in the year 2006, please visit this page). Brazil began its Pro-Alcohol programme more than 20 years ago to promote the use of ethanol as an alternative fuel for cars. At the time, Brazil had a military government, which wanted to reduce the country's dependence on imported Middle Eastern petroleum after the 1970s oil shocks. The idea fell out of favour in the 1990s after sugar prices rose and the price of oil fell, while Brazil's state oil company Petrobras discovered new offshore oilfields which reduced the need for imports. As oil prices continue to hover near the $70-a-barrel mark, amid fears that the world may soon run out of fossil fuels, carmakers and politicians alike are desperate to come up with alternative ways to power the world's motor vehicles. Even a man as closely linked with the oil industry as President George W Bush is now spreading the message that one day we may be growing our fuel instead of digging it out of the ground. "An interesting opportunity, not only for here but for the rest of the world, is biodiesel, a fuel developed from soybeans," he said in June last year. For the owners of today's polluting gas-guzzlers, it is easy to see this as something for the far-distant future, an irrelevance that will not affect their lives for many years to come. But in Brazil, it is already a reality. In the mid-1980s - before any other country even thought of the idea - Brazil succeeded in mass-producing biofuel for motor vehicles: alcohol, derived from its plentiful supplies of sugar-cane. Differently-powered cars were actually in the majority on Brazil's roads at the time, marking a major technological feat. But the programme that had put the country so far ahead was very nearly consigned to history when oil prices slid back from the high levels seen in the 1970s. Alcohol-powered cars fell out of favour and languished in obscurity until two years ago, when production picked up again in a big way. Now Brazilians are flocking to buy cars that give them the chance to mix and match alcohol with regular fuel - and conventional motor vehicles that run purely on petrol are looking old-fashioned once again. Brazil's state-run alcohol fuel programme was set up for patriotic, not financial or environmental reasons. The military government that ran the country from 1964 to 1985 wanted to reduce its dependence on Middle Eastern petroleum during the 1970s oil crisis. The technology was far from new, having been around since the 1920s, but no country had employed it on such a scale. Under the Pro-Alcohol programme, farmers were paid generous subsidies to grow sugar-cane, from which ethanol was produced. The price at the pump was also subsidised to make the new fuel cheaper than petrol, while the motor industry turned out increasing numbers of vehicles adapted to burn pure ethanol. As a result, in 1985 and 1986, more than 75% of all motor vehicles produced in Brazil - and more than 90% of cars - were designed for alcohol consumption. * State oil company Petrobras had discovered new offshore oilfields, making Brazil more self-sufficient in oil. There remained the environmental argument in favour of ethanol: unlike petrol, it is free of pollutants such as sulphur dioxide, while the carbon dioxide emissions it produces can be cancelled out by growing another sugar-cane plant. And in one lasting benefit, ethanol had already replaced lead in conventional Brazilian petrol, putting paid to the worst kind of airborne pollution. But despite ethanol's green credentials, Brazilian enthusiasm for the fuel reached its lowest ebb in 1997, just as the world was marking five years since Rio de Janeiro hosted the United Nations Earth Summit. That year, just 1,075 motor vehicles built to run on alcohol rolled off the country's production lines - a mere 0.06% of the total output. It was at that very point that the US started to show interest in biofuels, as the authorities in California and other states passed laws forcing car manufacturers to reduce pollution levels. The US now produces nearly as much ethanol as the Brazilians do, although the raw material it uses is maize rather than sugar-cane, while President Bush's biodiesel made from soybeans offers another alternative to petroleum. But Brazilian producers maintain their ethanol is still cheaper to produce - and their market has now received fresh impetus from a combination of tax breaks and technological advancement. A new generation of alcohol-powered cars entered production in Brazil in 2003, after the government decided that cars capable of burning ethanol should be taxed at 14%, instead of 16% for their exclusively petrol-powered counterparts. Unlike earlier models, these are "flex-fuel" cars - equally happy with pure alcohol, pure petrol, or any blend of the two. When the fuel tank is filled, a special computer chip analyses the mixture and adjusts the motor according to how much ethanol and how much petrol it contains. 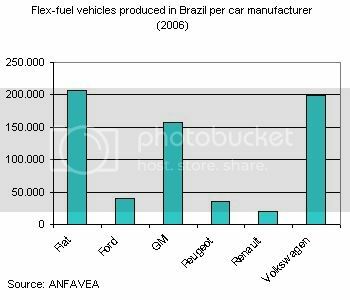 In 2004, the first full year that "flex-fuel" cars were on sale, they accounted for more than 17% of the Brazilian market. Last year, they scored an even bigger success, overtaking petrol-driven models for the first time since the 1980s and taking 53.6% of the market for new cars. But in the wake of the US, other countries are beginning to discover the wonders of crop-based motor fuel - and Brazil has a fight on its hands if it wants to remain the world leader in the field.